After military promotion at age 90, Lehi fighter Ezra Yachin hopes to continue acting on behalf of the Jewish people for as long as he can. 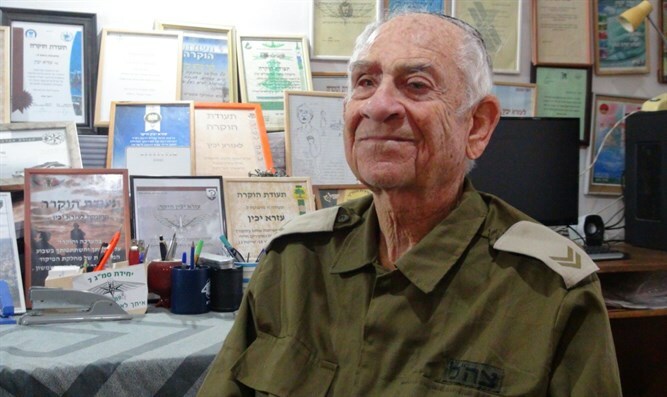 In an interview with Arutz Sheva, Lehi fighter Ezra Yachin describes his feelings over his recent promotion in military rank at the age of 90. Yachin gives an example of the abundance of lectures filling up his schedule. "Every day, one, two or three lectures," he says. "The IDF discovered that since the Yom Kippur War I gave 9,000 lectures in the army, and it is possible to double the number if you include the lectures to police, Border Police, security forces, in communities, in pre-army academies, yeshivot and ulpanot. I do not want to rest. God gives me the ability to continue to run and tell." He hopes to be continuing in his public relations activities in the next five years: "The forces from heaven and my desire to act for the people of Israel are very strong," he explains. Yachin dismisses reports of a delay in his promotion due to his right-wing positions and his opposition to the service of women. According to him, all this is idle talk not worthy of being addressed, and actions are the determining factor. "We fought against the English Goliath and wiped out his presence in the country. A small stone killed him, and I remained alive with two shells - that means something," Yachin says, recalling the line from the Lehi anthem: "We were all recruited to the ranks for life, only to be released in death." “I still haven't been released from the ranks," he says.